Media coverage of the referendum principally focused on (a) the drama and dynamics of the campaign, (b) the economic implications of leaving the EU and (c) immigration and border controls.This narrow issue agenda was consistently evident in TV news, pro-Remain newspapers and pro-Leave newspapers. 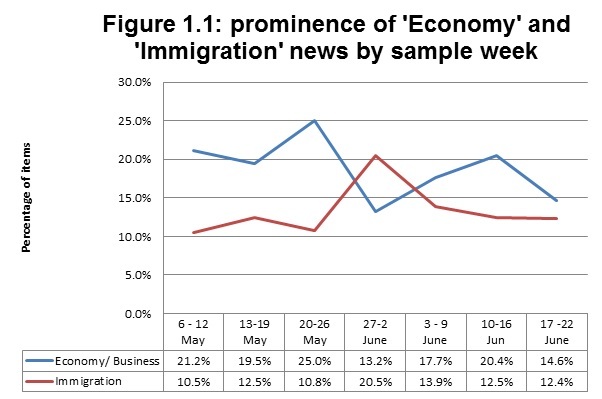 Economic news exceeded coverage of immigration for all but one sample week. However, in the last days of campaigning the gap between them narrowed. Many issues that have received considerable media attention following the referendum, received negligible coverage before the vote. For example, consideration of the devolution implications accounted for 0.8% of all coverage and taxation issues were covered even less, accounting for 0.6%. 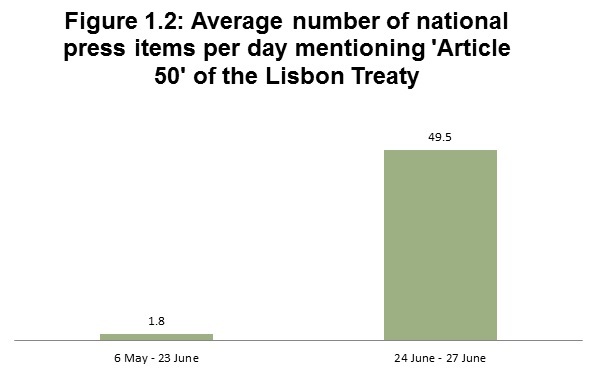 Between Friday 24 June and Monday 27 June, the national press published 198 items mentioning Article 50 of the Lisbon Treaty (which triggers the exit process). This represents a daily average of 49.5 items. Between 6 May and 23 June, they published 88 items mentioning Article 50, a daily average of 1.8 items. The dominance of Conservative party representatives, which we noted in our first report, was sustained throughout. The brief upswing in Labour party representation noted last week, fell back in the last days of campaigning. The coverage was also highly ‘presidentialised’, dominated by the Conservative figure heads of the IN and OUT campaigns. Despite concerns expressed at the start of the campaign, the Referendum was largely a ‘he said-he said’ contest. Women were consistently marginalised in news reporting throughout, despite the inclusion of women in several major televised debates. 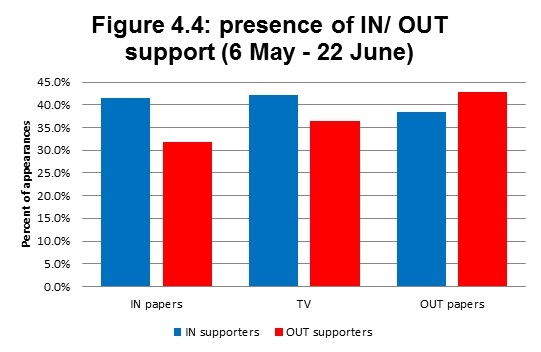 National press coverage was highly polarised, with pro-IN papers emphasising pro-IN campaigners and arguments, and pro-OUT papers emphasising pro-OUT equivalents. 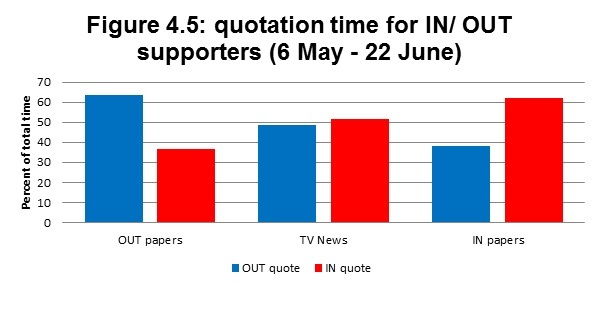 In aggregate terms, this produced a ‘coverage gap’ of 60%: 40% in favour of OUT campaigners. However, when these differences are weighted by circulation, the difference extends to 80%: 20%. 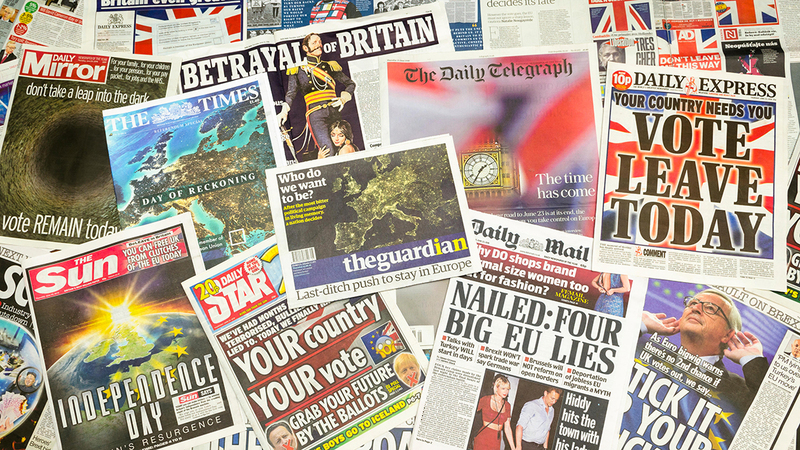 This is the fifth report by the Loughborough University Centre for Research in Communication and Culture (CRCC) on national news reporting of the 2016 EU Referendum. Television: Channel 4 News (7pm), Channel 5 News Tonight (6.30pm), BBC1 News at 10, ITV1 News at 10, Sky News 8-8.30pm. Press: The Guardian, The Times, Daily Telegraph, Financial Times, Daily Mail, Daily Express, Daily Mirror, The Sun, Star and the I. We analysed all EU Referendum related news found in the entire duration of all the above named television programmes. For the press, we included referendum news found on the front page, the first two pages of the domestic news section, the first two pages of any specialist election section and the page containing and facing the papers’ leader editorials. Inter-coder reliability tests were conducted to check the robustness and consistency of these measures (see the website for more information). Regarding our terminology and coding protocols: we use the term ‘IN’ to indicate individuals and organisations supporting the case for the UK to remain in the European Union. We use the term ‘OUT’ for those advocating the UK’s departure from the EU. We do not categorise people or organisations according to our prior knowledge of their political viewpoints. Rather, individuals or organisations are only assigned to these categories when their affiliations are manifestly stated in editorial content and/or they articulate support for one of these positions. Issue Balance – which topics have received most coverage and how has the news agenda developed over the campaign? Stopwatch Balance – which individuals or institutions have featured most frequently? Gender Balance – what ratio of coverage of women to men has there been? Directional Balance– has news coverage tended to favour arguments to remain in or leave the EU? This section examines the issue agenda in the reporting of the referendum during the sample period. What issues have dominated coverage so far, and what have failed to attract much attention? And has there been any shift in the media agenda on a week by week basis? Table 1.1 compares the relative prominence of different issues in TV news, pro-IN newspapers and pro-OUT newspapers for our entire sample period. There is a remarkable consistency in the issue agendas of TV news, pro IN newspapers and pro-OUT newspapers. Pro OUT newspapers gave greater prominence to matters concerning political standards and/ or corruption in the EU. Immigration retained its relative prominence in the last days of the campaign, despite the suspension of campaigning following the murder of MP Jo Cox and the call for less divisive political debate following the tragedy. The economy’s lead as the most prominent substantive issue reduced over the same period. Throughout the campaign three issues dominated the media agenda: the economy, immigration, and the conduct of the campaign itself. In the first three weeks of the campaign economic issues received consideraby more attention than immigration to the benefit of the In campaign. There was, however, a significant shift in week 4 with immigration overtaking economic issues and this signalled a shift in momentum towards the OUT campaign. Subsequently, while the economy regained its pole position, there was much more of a sense of parity between the two main substantive issues in the final weeks of the campaign than at the start. The issue of immigration received more than twice as much media attention than the issue of sovereignty, which serves to question post-referendum claims from the official OUT campaign that the issue of immigration was not central to the political process. The referendum debate was certainly not about the consequences of the vote for the issue of devolution with the issue attracting less than 1% of media coverage. Given the clear majorities for Remain in both Scotland and Northern Ireland and post-referendum calls for independence, this is a remarkable absence in the coverage of the campaign. 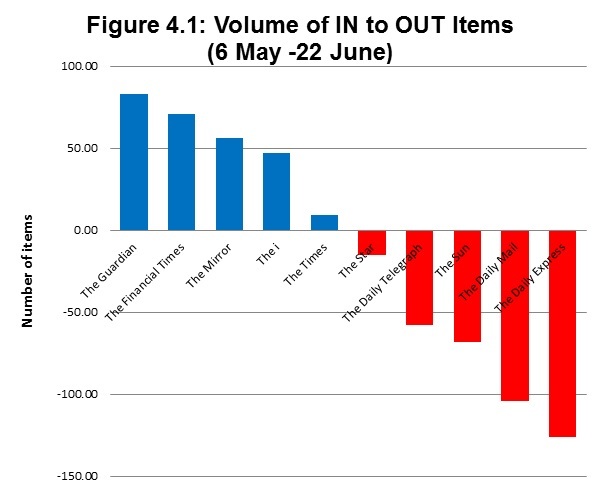 As a supplement to this point, we have examined how frequently national newspapers referred to ‘Article 50’ of the Lisbon Treaty in coverage before and after the referendum decision. (This is the procedure that governs how a member state leaves the EU.) 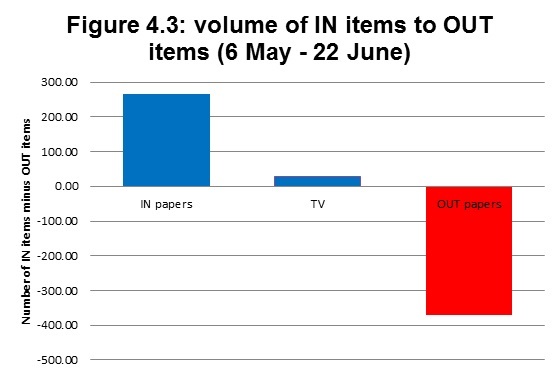 Between 6 May and 23 June, an average of 1.8 items per day across all national papers mentioned Article 50. Between 24 and 27 June this average figure has risen to 49.5 items per day. This section examines which individuals, organisations and institutions received most media coverage. Table 2.1 identifies the ten most prominent politicians for the entire sample period. Seven of the top ten people and half of all people in the top thirty are Conservative politicians. In all, they account for 73% of the total number of appearances in the top thirty. The most frequently reported Labour politician was Jeremy Corbyn (7th). Only ten Labour politicians made the top thirty. They account for 15% of the total number of appearances in the top thirty. Only two representatives from other UK political parties made the list: Nigel Farage (4th) and Nicola Sturgeon (16th). No representative of the Liberal Democrats made the top thirty. The top seven people are all men. Nine of the thirty people are women, but only one woman (Priti Patel) made the top ten. Only three non-UK based people made the list: Donald Tusk (=14th), Jean-Claude Juncker (20th) and Angela Merkel (=26th). Figure 2.1 compares the relative prominence of political parties. 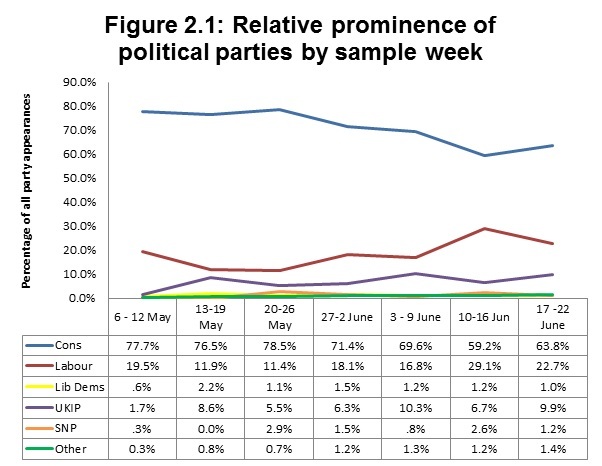 The surge noted in Labour party appearances between 10th to 16th June was not sustained into the final week of campaigning, where once again Conservative sources established a considerable dominance over all other parties. Of the minor parties, only UKIP has established and sustained any consistent media prominence. The Liberal Democrats and the SNP remained highly marginalised across the entire sample period. Conservative sources gained greatest prominence in newspapers supporting OUT and least in TV news. Labour party prominence, by comparison, was equivalent across all categories. Newspapers supporting IN gave greater prominence to business sources. Television news gave far higher levels of coverage to the views and actions of citizens. The Referendum was dominated by Conservatives in two different senses. Firstly seven representatives were among the ten most prominent figures during the campaign and the party also supplied half of the top thirty who attracted nearly three quarters of appearances between them. Secondly this advantage was significantly magnified by the presidential nature of a debate where the explicit news media focus was on a relatively small group of individuals led by the two major protagonists on either side: the Prime Minister and his potential successor Boris Johnson. Their prominence, together with the other men who dominated the campaign, also made this a decidedly male-centred campaign. Although just under a third of the top thirty were women, most were placed in the lower half of the list having collectively attracted just 10% of all appearances. The most prominent female campaigner was Priti Patel who, along with Mayor of London Sadiq Khan, provided a BME presence in an otherwise white dominated debate. Three non-UK based campaigners also made the top ten in the guise of the most prominent EU leaders including German Chancellor Angela Merkel. Overall there was broad parity between representatives of the IN and OUT campaigns listed in the top thirty with the former making a tenth more appearances than their rivals. Within this there was noticeably less coverage of non-Conservatives including Labour leader Jeremy Corbyn. Several of his colleagues made the top thirty but only did so in the bottom half of this group. Furthermore in reporting by both the IN press and TV the ratio of Conservative to Labour appearances was approximately three to one rising to four to one among the OUT papers. Collectively Labour representatives received just over a seventh of appearances devoted to this in the top thirty with the penultimate week of the campaign being their most prominent one in news terms. Despite all having longstanding positions on the European issue the other party leaders, with the exception of Nigel Farage, received markedly less coverage than they had in the 2015 General Election. No Liberal Democrat and Green spokespeople made the top thirty and the only representative to do so from the similarly pro-EU Europhile the Scottish National Party was its leader and Scotland’s First Minister Nicola Sturgeon. Sturgeon ranked in the middle list compared with Farage who was the most prominent non-Conservative figure in the campaign. Furthermore the UKIP leader was the only member of his party who attracted significant media attention. Of the non-party representatives featured in the news coverage, business people were more prominent in the IN rather than OUT press and TV. More noticeably the broadcasters gave markedly more attention to the concerns of citizens compared with the print media. 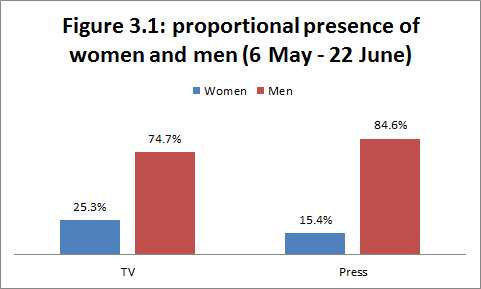 Figure 3.1 shows the proportion of women in TV and the press. There is a 10% gap between the prominence of women on television and in the press where they account for just 15.4% of individuals. 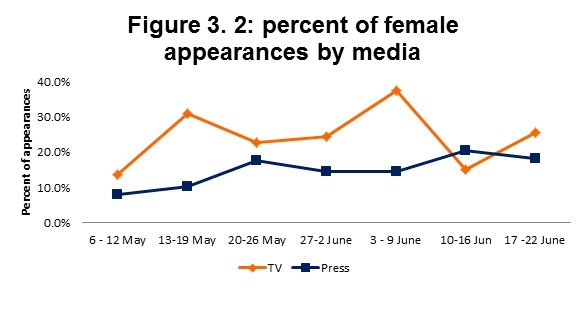 Figure 3.2 shows the percentage of women appearing in the press and on television across the seven weeks of the sample period. The presence of women increased from a low point of 13.6% of individuals on television and 8.1% in the press during the first week. Television featured more women than the press with the exception of the penultimate week of campaigning. Table 3.1 compares the average quotation time or length for women and men on television and in the press. This means that when women do appear in the coverage, they receive as much quotation time and space as men. The main problem is that they do not have access to the media. Female citizens account for half of all ordinary people on television but just 39.1% of those appearing in the press. Figure 4. 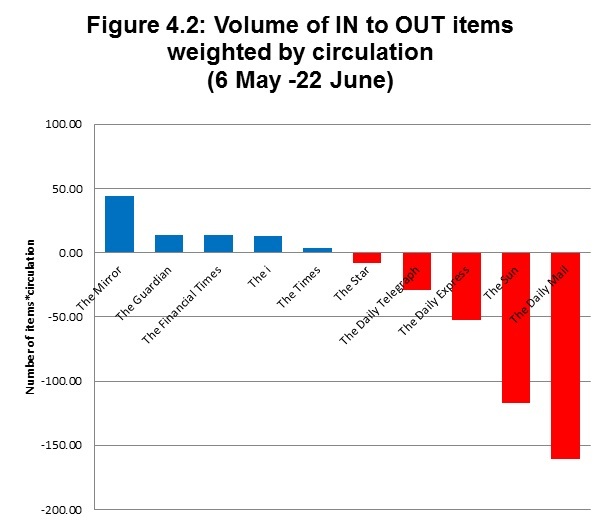 1 compares the volume of items in newspaper coverage that favoured either side. Figure 4.2 weights these figures by the circulation of each newspaper. IN: 19.5% versus OUT 80.5%. Table 4.1 includes television news in a comparison of the distribution of items that favoured positions in the Referendum debate. As one would anticipate from the previous results, Pro IN newspapers presented a higher proportion of items that favoured IN positions, and the reverse pattern was evident with the pro OUT newspapers. Pro IN newspapers had a higher proportion of balanced/ neutral items than pro OUT newspapers. In more than 4 in 5 cases, items in the broadcast coverage did not privilege the arguments of either camp. On the minority of instances when this occurred, IN items received more prominence than OUT items. Pro-IN newspapers gave 10 percent more coverage to individuals and institutions supporting the UK’s continued membership of the EU. TV news gave 6 percent more coverage to individuals and institutions supporting the UK’s continued membership of the EU.